Is there a better, but still affordable alternative to terrace houses? It was in 2003 that I first stumbled onto a new idea based on an existing type of neighbourhood layout, already popular in countries like the US and Australia. Cul-de-sacs are popular: they are perceived as being safer, more exclusive and neighbourly. According to one study, between the ‘grid’, ‘loops’ and cul-de-sacs, the latter were the most popular. However, in developing countries like Malaysia, only the very rich can afford to live in quarter-acre detached houses located in a cul-de-sac. Is it possible to yield as many units per acre compared to terrace houses? First, the cul-de-sac is made bigger so as to fit in a public green area in the middle in order to meet local planning regulations that require 10% of any residential development to be open space. Then, an interlocking arrangement of cul-de-sacs is created such that each building lot would face two or three cul-de-sacs. 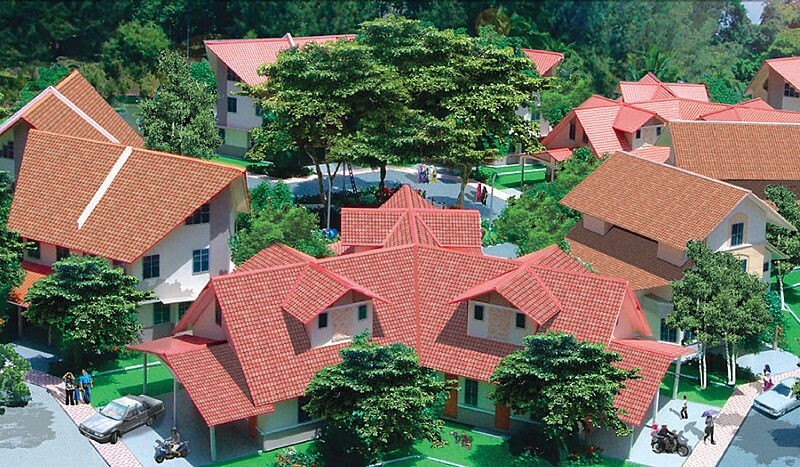 If the buildings in this layout were detached houses, they would be priced in the top range of the market. 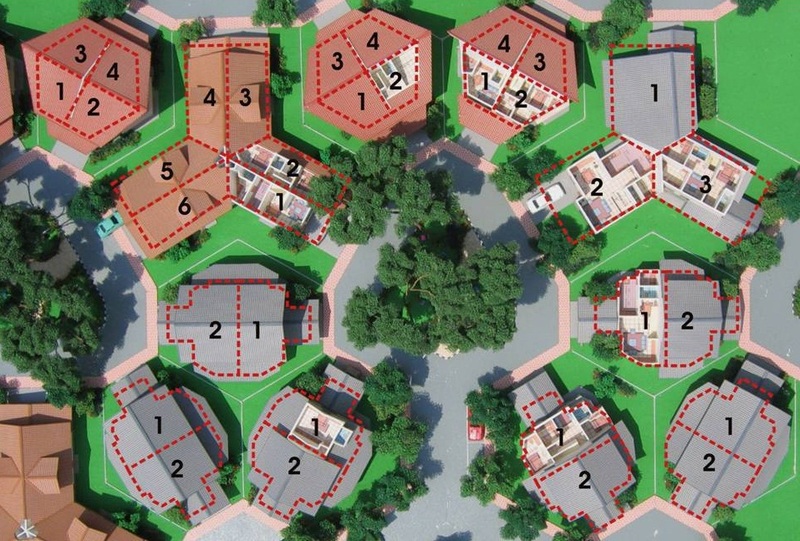 But instead, the buildings are divided into 2, 3, 4 or 6, creating duplex, triplex, quadruplex or sextuplex units (figure 3). As the buildings are divided, the land area and the built-up area become smaller; the number of units in the layout and the density of the development go up to rival that obtained in terrace house developments. In this way, the housing units become less expensive. Yet each house still retains a public access. The size and shape of the external environment are not changed – only now more units share it! Since houses are built around a small park with shady trees, this communal garden is easily accessible to all in the cul-de-sac, allowing it to act as a social focus that can encourage social interaction and neighbourly spirit (figure 4). The courtyard area has the qualities of what has been called "defensible space" – territory that residents regard as their own, that they oversee, looking out for strangers and signs of potential wrong-doing, thereby inhibiting crime. The short winding cul-de-sacs reduce both traffic speed and volume, and therefore, become safer for even small children. Apart from the social aspects, there are cost advantages too. Compared to street laid out on grids like terrace houses, the honeycomb layout, like cul-de-sac layouts in general, have fewer roads. Back lanes are also totally eliminated. Having shorter roads to build not only come with fewer drains, sewerage and water piping but also leave behind more space for houses and gardens. We found that in general, compared to conventional terrace house layouts, we could achieve the same number of units per acre or density. But in terms of land-use efficiency, the percentage of the development land that is saleable, the Honeycomb layout always turns out better than terrace houses. These findings were exciting; this new type of housing was not only better than terrace houses but was cheaper too. I believed that developers would be rushing to get them built!